Speak Up Storytelling: The Podcast available today! Elysha and I are thrilled to announce THE FIRST EPISODE OF OUR NEW PODCAST SPEAK UP STORYTELLING. Unlike most storytelling podcasts, which offer you one or more outstanding stories to listen to and enjoy, our podcast seeks to entertain while also providing some specific, actionable lessons on storytelling. Each week we will bring our expertise in storytelling to you! 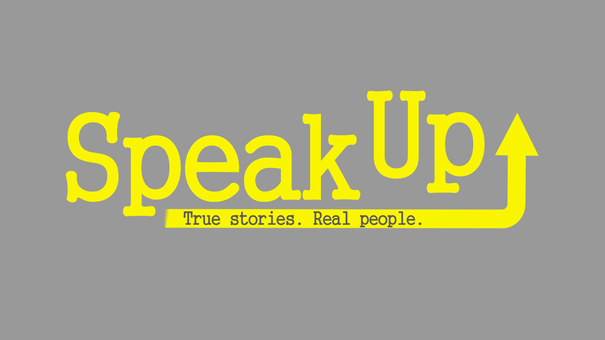 In every episode, Elysha and I will listen to one of the many stories told and recorded at Speak Up over the last five years, followed by a lesson on storytelling based upon what we just heard. We'll talk about the effective strategies used by the storyteller. We'll offer tips on things like humor, stakes, transitions, suspense, and the ordering of content. We'll also suggest possible revisions to make the story even better. Whether your goal is to someday take the stage and tell a story or simply to become a better storyteller in the workplace or your social life, this podcast is for you. In addition to story and instruction, we will also talk about finding stories in your everyday life, answer listener questions, offer recommendations, and try to make you laugh. We may also interview storytellers from time to time, as well as provide feedback on stories you submit to us. You can download the podcast wherever you get your podcasts: Apple Podcasts (iTunes), Stitcher, Overcast, Google Play, or you can listen to the first episode here. We'd love to hear what you think about the podcast and any questions you'd like us to answer on the podcast, so please send any questions or comments to speakupstorytelling@gmail.com. We would also love for you to rate the show. Ratings help other listeners find the show, so please take one minute to jump over to Apple Podcasts (or wherever you listen) and give us a rating and/or comment. This podcast has been a long time in the works. We hope you enjoy!